Product prices and availability are accurate as of 2019-04-18 20:24:06 UTC and are subject to change. Any price and availability information displayed on http://www.amazon.com/ at the time of purchase will apply to the purchase of this product. Keep everyone's travel essentials together and well-organized in the Samsonite 5-Piece Travel Set. 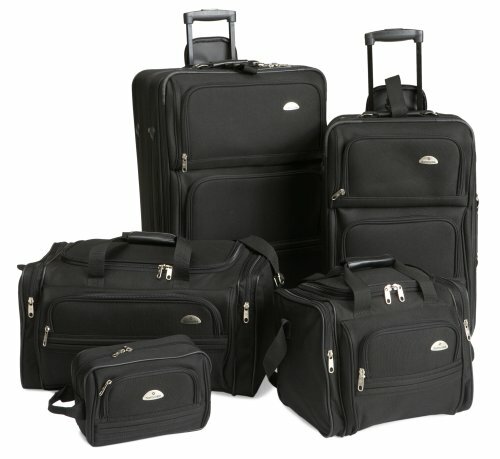 This sturdy, lightweight set includes a 26 upright, a 22 upright, a travel duffel, a toiletry kit, and a travel tote. Crafted from durable 1200 denier polyester, this set has an EVA foam front panel for a clean, tailored appearance. Uprights have push-button locking handle systems for easy maneuverability and inline skate wheels for smooth rolling. The uprights have spacious, lined interiors with tie-down straps for keeping folded clothing neat and wrinkle-free, plus zippered mesh accessory pockets. The toiletry kit, duffel, and travel tote contain numerous zippered pockets for organizing smaller necessities, and the Samsonite 5-Piece Travel Set has a bottom grip to make lifting easy. EVA foam front panel for a clean, tailored appearance Inline skate wheels for smooth rolling Push-button locking handle system for easy maneuverability Bottom grip makes lifting easy Fully lined interior This is a 5 Piece Nested Luggage Set. The smaller pieces are packed within the larger pieces.